A private tasting group assembled this set of four wineries/back-to-back vintages. The 1978 vintage was regarded as quite a good one. The growing season was rather warm, with a vintage-time heat spell which propelled sugar levels to elevated levels. The crop level was regarded by most as larger than normal. The 1979 vintage was described by many as "difficult." The weather towards the end of the growing season turned hot and then wet. The best wines were made from fruit harvested prior to the rains, but those made of grapes picked later in the season were more problematic. Many wines were less showy than the flashier, riper wines of the 1978 vintage. As these bottles all came from private cellars, we don't know their "history" and storage conditions, so that may have played a part in the results. Clearly, though, these were faded in terms of fruit, though tannin was still a significant part of their make-up. These, though, were made during the 'first stretch' of California's race to gain attention for quality wines on a world stage. "Off notes in the nose which faded to 'ugly' on the palate." was the assessment of one participant. "It did not fare well," said another, adding, "Fare well." "Oxidized and maderized." were the adjectives sounded by one fellow. Another taster described it as having a fragrance reminiscent of "Bloody Mary mix, being having a tomato-like note...very strange." My notes described it as being "Old, sweet fragrances...the smell of a tired, faded wine." The tannins have been resolved, for the most part. "Silage...valley fruit...vegetable tones and still some tannins." said the first commentator. "Complex, cherry notes, but slightly over the hill." offered another. "Past its prime with unripe berry notes and forest-floor elements and mouth-drying tannins." Someone else found it to have a "complex and long finish," while another said "It's too astringent." "Cheese-like notes," said the first taster, adding "It's almost gone." One lady found it "Sour and rancid." Someone else described this as "Smoother, old, with a taste reminiscent of licorice and a burnt note...it evolved in the glass with dried cherry, dusty notes...charred plums." Another found this to have a "hint of a weedy note." I described it as having "old, sweet, faded fruit notes with some of the tar-like fragrances of the two "Barolos" above. There was also a prune-like character." Smooth on the palate, with a tea-like flavors. "This cried out for olive oil!" said one fellow, "Because it would make a great salad dressing!!" Another person found it to be "Mature, spicy and dusty, with pickle barrel fragrances and still a fair bit of tannin." One other in the crowd echoed the tannin theme. Others found "tart" notes, one person finding it to "still have fruit and a bit of aging potential." A pepper note was found by someone else, while another found "earth and unripe cherries and mouth-drying tannins...."
I thought it had some cassis and gamey notes on the nose. On the palate it's mildly astringent and a touch bitter. For "wine tasting" purposes, it is out of balance, but it might "work" better on the dinner table. Not many people would have given this Santa Cruz estate much of a shot at having both its wines in the 'upper division' were they to handicap this horse race. 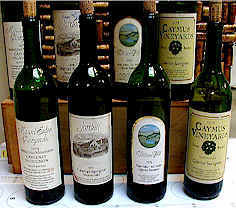 Yet the Santa Cruz Mountains appellation was highly regarded for Cabernet before Prohibition. "Tobacco...powerful." were two adjectives used by the first person to sound off. Another found this to have a higher level of acidity than the rest of the wines. "Still tannic and full, with odd, burnt, cooked fruit notes...almost like Fernet Branca." were the intonations of one woman. "Dusty, currants and stewed plums." said one gentleman. "Smooth entry, great structure and a long finish." were the notes read off by someone else. I found some berry fruit, but a touch of a fragrance which reminded me of either rubber or plastic. It is rather astringent and mouth-drying with a hint of wet earth to go with its very reticent fruit. The gamblers probably wouldn't have pegged this to win, place or show. Yet there was Jordan's 1979 faring well. "Green olives" were found by one person. "Bell peppery, herbal, weedy...a little hot and astringent, yet sweet." were elements found by someone else. "Spicy, salty, pruney." were the words of another taster. "Past its prime, with vegetal notes...almost a celery juice character." said one fellow. Another person found "Merlot notes, coffee and it was less flawed than the other wines." I found the herbal, green olive/green bean fragrances with a touch of wood. I thought it was still fruity on the palate, herbal and Cabernet-like with a touch of tannin on the finish. "Strongly redolent of tobacco, with cassis...it's very clean and has a good finish." stated the first commentator. The second speaker described it as "...past its prime, with some sulfury notes and an elegant, soft mouthfeel...a medicinal, almost ink-like flavor; you know, like if you bit into a Bic pen." One woman found "Bizarre, vegetal notes with a hint of scorched, burnt chocolate." Another fellow found "Zinfandel-like elements and raspberry notes." Someone else detected a "petroleum scent." "Great balance and spice, with tobacco and cherry notes and nice wood...very well-made." offered the first person to describe the winner. Someone else took issue, saying "The focus here is on a stinky, Brettanomyces-like note; disturbingly so." "Sweet oak and sweet fruit." countered another panelist. "Soft and drying tannins...mushroom and unsweetened chocolate." were elements found by someone else. I couldn't tell if the wine had some cellar fragrances or a cork note, but the dusty, Cabernet fruit was the most alive and attractive of this bunch. It is still youthful on the palate and those "cellar notes" I found on the nose don't intrude on the palate. I can recall tasting this when it was released (a sign of my 'old age', huh?) and remember it as one of the shining stars of the vintage, along with Villa Mount Eden. Too bad the current owners of the William Hill brand don't make much wine which interests connoisseurs.